Learn about the Wavefront OpenShift Integration. Kubernetes is a popular open source container orchestration system. This integration uses the new Wavefront Kubernetes Collector to collect detailed resource metrics about the containers, namespaces, nodes, pods, and the Kubernetes cluster itself and sends them to a Wavefront proxy. This integration also explains how to configure and collect kube-state-metrics. The kube-state-metrics service listens to the Kubernetes API server and generates metrics about the state of Kubernetes objects. In addition to setting up the metrics flow, this integration also installs dashboards. Here’s a preview of some of the pod charts in the Kubernetes dashboard. 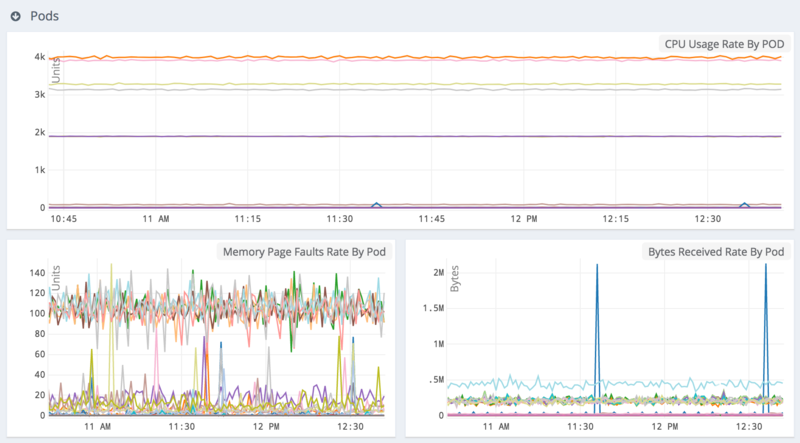 Here’s a preview of some of the charts from kube-state-metrics dashboard. Note: This integration provides updated setup instructions and dashboard for Kubernetes. For the previous setup instructions, see the Kubernetes (Archived) integration in the Archived section. This collector supports monitoring of Openshift Origin clusters. See Installation and Configuration on OpenShift. Follow the instructions below to set up Kubernetes monitoring. Download wavefront.yaml to your system. Edit the file and set WAVEFRONT_URL to https://YOUR_CLUSTER.wavefront.com/api/ and WAVEFRONT_TOKEN to YOUR_API_TOKEN. Run kubectl create -f </path/to>/wavefront.yaml to deploy the proxy. The Wavefront proxy and a wavefront-proxy service should now be running in Kubernetes. Download kube-state.yaml to your system and run kubectl create -f </path/to>/kube-state.yaml. The kube-state-metrics service should now be running on your cluster. Replace clusterName=k8s-cluster to uniquely identify your Kubernetes cluster. If RBAC is disabled in your Kubernetes cluster, comment out serviceAccountName: wavefront-collector. If the read-only kubelet port is disabled, replace the kubernetes source as described here. Run kubectl create -f </path/to/wavefront-collector-dir>/ to deploy the collector on your cluster. To verify the collector is deployed, run kubectl get pods -n wavefront-collector. If you do not see metrics in the Kubernetes dashboard, check the logs from the collector and proxy pods. Wavefront provides a HPA adapter for autoscaling your pods based on any metrics in Wavefront. See wavefront-kubernetes-adapter for details.